Bar Gagarin Berlin is high on the list of restaurants that we bring visitors to when they are staying with us in Berlin. In summer one can lie back on a lounger while drinking coffee and having brunch. In winter, snuggle up with some blankets and try a hot chocolate topped with cream and with a shot of vodka. Our favourite is one of the house specialities; , blini filled with salmon and served with horseradish sauce – a real central European taste that ought to catch on in other parts of the world because it is so good. They also do a good Sunday brunch, but for that we normally go next door. 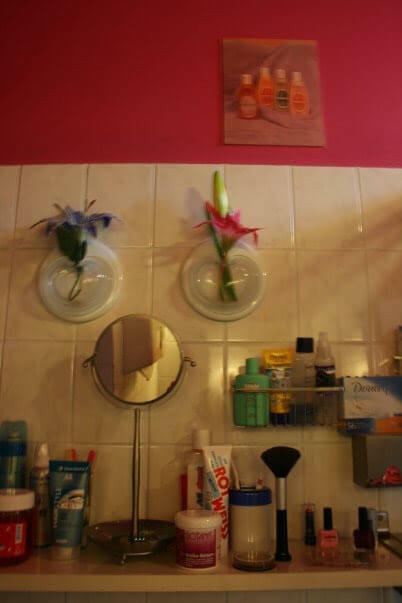 Gagarin also has the cutest bathrooms that are filled with everything you might need to glam yourself up for a hot date from makeup in the women’s (pictured left) to razors and toothbrushes in the men’s. Its at Knaackstrasse 22 and you can call them on 030 4428807. It is also really close to the Rykestrasse Synagogue so you could combine your visits to both of these fantastic places.